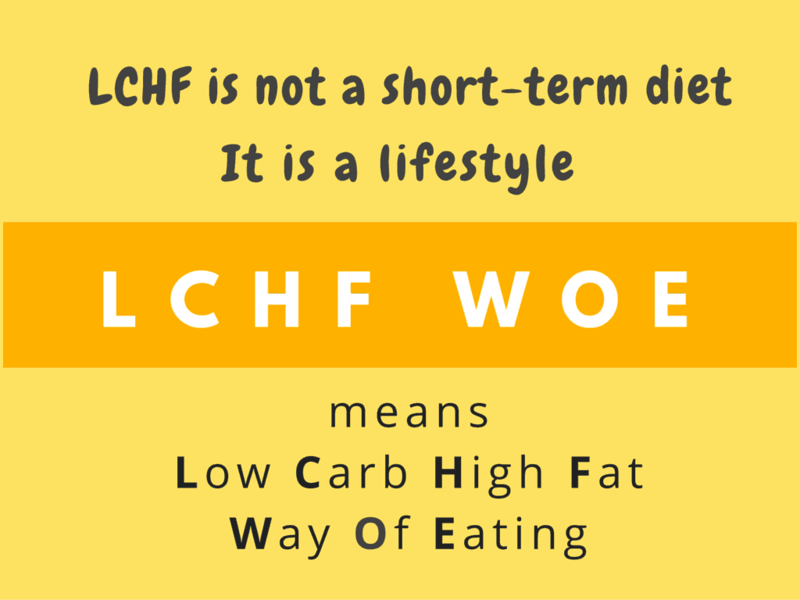 What is LCHF (low carb high fat)? What it means & why it is good. It involves eating more natural & good fats and few carbohydrates. Why would we do eat fewer carbs and more fat? To become healthier, to lose weight, to reduce inflammation, to reverse diabetes and to decrease or eliminate the risk of a host of other diseases like blood pressure, cholesterol problems, heart disease etc. But to prevent all these diseases, we must eat less fat, right? We are so used to the ‘low calorie, low fat’ and ‘eat less, exercise more’ theory for many decades. Has it worked? Does it work? Is it the right approach? Read on a bit more. Read more both on this website and elsewhere, gather knowledge and draw your own conclusions. Watch this clear, explanatory 11-min video to understand the basics. According to the mainstream Food Pyramid, it is recommended that we eat mostly by carbs, a little protien and very less fat – as energy for our body. But in LCHF WOE (Way of Eating), the main source of energy is fat, not carbohydrate. Why should we fuel our body in this “controversial” and “unconventional” way? There should be a very small amount of sugar circulating in the blood (less than a teaspoon). If there is excessive glucose in the blood, it is dangerous. So the body has a mechanism to move the sugar out of the blood stream. How does the body move sugar out of our bloodstream? A hormone called ‘insulin’ makes it happen. The constant high level of insulin secreted because you’re constantly eating carbohydrates makes you fat. If insulin is low, body will use your own stored body fat as fuel. If insulin is high, body will use some carbs for energy and store the remaining carbs as fat. If you eat carbs, insulin will be high. So, stored body fat will not be used for energy. How to make the body secrete less insulin? Eat fewer carbohydrates, preferably from non-sugary, non-starchy, unrefined sources. Most carbohydrates (except from some plant sources) create a high insulin response. To reduce insulin response, it is best that the preferable sources of carbs are some vegetables. The body stores very less glycogen (the storage form of carbs). There are limited storage sites for carbohydrate in the body. The body stores more fat. There is unlimited storage sites for fat in the body. Even a thin person carries about a 2-month reserve of fat supply. So, when you eat a high-carb meal, the body fills up the limited glycogen storage sites, and converts the excess carbs to fat and fills up the fat storage sites. That’s why when you eat a high-carb meal, most of it get converted to fat. So, you’ll feel hungry again in around 3 hours. And you’ll eat another high-carb meal or snack. This happens around 5-6 times a day. So, more and more fat is being stored in the body. Conversion of glucose to fat is a one-way street. You cannot convert fat back to glucose. What happens when we eat fewer carbohydrates on the LCHF WOE? You burn more body fat and store less. Instead of manufacturing new body fat, you’ll burn existing body fat. But fat has more calories! Is that not bad? Try eating 200 calories from butter, 200 calories from meat and 200 calories from rice. And see which makes you more full. You can’t eat more than 30 gms of butter at a go. That’s 270 calories. On the other hand you can easily eat a cup (about 190gms) of cooked brown rice. That’s around 760 calories. See the difference?! Fat is a satiating form of energy that creates minimal insulin response and helps reduce your food intake. On the LCHF, it is better to count carbs instead of calories.